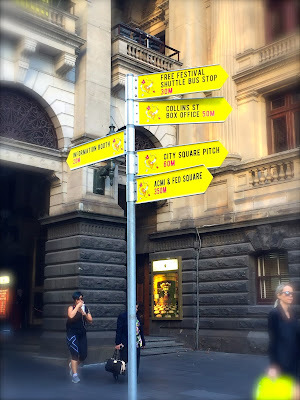 Sea of bright yellow flags and banners trumpeting the arrival of the very much-anticipated Melbourne International Comedy Festival 2016 is colonizing various parts of the city. Being the 3rd largest international comedy festival in the world, the city of Melbourne will be entertained by over 500 shows by 2000 performers over 4 weeks in March and April. I like watching a stand-up comedy show once in a while, but to say I am a big fan of such trend of performances will be a lie. My personal opinion: the comedy stage has slowly turned into a forum for the coarsest of language, a platform for uncontrolled and liberated speech of sensitive and offending topics. Funny means being grumpy and intolerance of anything different from yourself; a good laugh means poking fun at the imbecilic view of another; a top notch comedian must have the polished skill to mock an accent of a different race. Hilarity is synonymous to an overflowing indulgent of the crudest sexual and racial theme jokes. The use of a range of foul words has become an essential ingredient of a successful and loveable performance. Granted, watching a comedy show is an entirely different experience from watching a Steven Spielberg’s film on war. So if you are looking for a spiritual enlightenment or on a quest for life motivations, you have come to a wrong theatre house. If you are unable to bear the jokes of those witty comedians’ limitless and unrestrained creativity, then walk away please. We have better audiences! Don’t get me wrong. I have my utmost respect to the comedians. It is a challenging job to entertain yet at the same time, not to fall into the self-made trap of sounding stupid or classless. It needs huge courage to crack a joke, and believe that it will bring down a house with raucous and spontaneous laughter. It needs a strong mindset and a positive personality to keep a comedian floated above the waves of uninvited pressures. Being such an unpopular, hard-to-be-pleased and selective comedy-show non-fan, it is not difficult for me to come out with my two personal favourites (since I don’t have many to start with). Tastes vary, after all. It is hard not to love Nina Conti. She is a spectacularly talented ventriloquist. Her usual stunt involves strapping a comical half-mask onto her selected audience’s face, expertly manipulating her human dummy’s mouth up and down at arm’s length, and creating an entirely new personality out of the cartoonish-looking dummy with hilariously exaggerated voice. Nina picks up on the dummy’s body language instantaneously, develops clever conversation without displaying much effort, and invents riotously funny plot with her amazing voice-throwing skill. Nina is full of unpredictable surprises, and it is difficult not to be impressed by her quick wittedness. Nina will be performing at the Arts Centre Melbourne from 29 March 2016 to 10 April 2016. Click here to find out more. The show is an unexpected delight. Tegan’s stand-up show, The City of Love, was a one-hour recap of the personal journey of a small town Dandenong girl realizing her childhood dreams. A great storyteller, Tegan led the audiences into her hilarious and struggling excursions of achieving her life-long goals: getting married and have kids by the age of 25, be an action movie star, and to fall in love in the romantic city of Paris. The hilarity of the show revolves around her youthful silliness and innocence in trying to have her dreams come true. The entire performance was charming, heart-warming, cheeky, and funny in a very sweet way. I had a great time watching the show. Tegan is performing at the Greek Centre from 24 March 2016 to 3 April 2016. Click here to find out more. You can check out the (horrendously long) list of events from the official website here. There are also some family friendly, free performances happening at the Federation Square and City Square on a daily basis (save Monday) until 17 April 2016. Check out the link here for more information. I hope you have a great laugh, and let me know if you have a favourite comedian that you wouldn’t mind recommending to me!